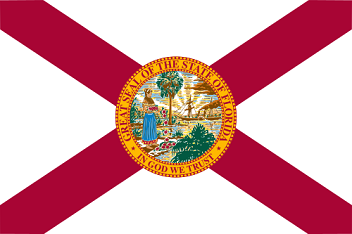 The State Flag of Florida features a red St. Andrew's cross on a white background. 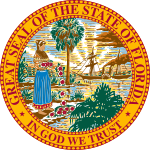 The image depicted is the seal of the state with a Seminole Native American spreading hibiscus flowers. It serves as a symbol of honor, heritage and regional pride and is displayed at state buildings. There is a strict Order of Precedence for flags. State Flags are displayed in order as they entered the Union. Car Flags are often displayed to represent of an individual's allegiance to their state. Florida State car flags are used by their owners as mobile emblems of their home. Car flags are usually made from strong materials and are attached to a car via a pole and clip window attachment. What is the design of the Florida state flag? What is the history of the Florida State Flag? The famous phrase "Five Flags over Florida" refers to the five governments that exerted sovereignty over all, or part of Florida. 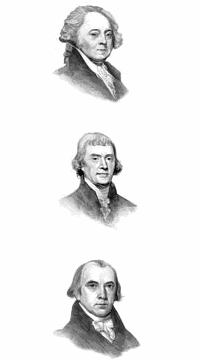 The "Five Flags over Florida" were the flags of Spain, France, Great Britain, the United States and the Confederacy. It was officially adopted in 1900 and was revised in 1985 to conform to the corrected state seal. The Florida flag is kept and used as required by the code specified in the constitution of the state.